Today, someone paid a record of just over $1.1 million, for a 750-milliliter bottle of single malt whiskey described as “the Holy Grail” of the dark alcoholic spirit, reports The New York Times. 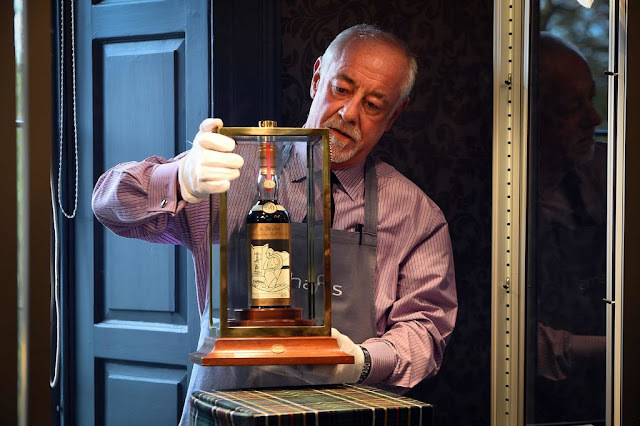 The 60-year-old bottle of Macallan Valerio Adami 1926 is “one of the rarest and most desirable bottles ever produced,” according to a specialist at Bonhams, the auction house in Scotland that made the sale. The identity of the private buyer was not revealed. But a Bonhams spokesman said on Wednesday that the person was from Asia. The sale is the second time this year that a bottle of whisky has gone for a record amount. In May, a bottle from the Macallan Valerio Adami 1926 edition fetched 8.6 million Hong Kong dollars, about $1.1 million, at Bonhams in Hong Kong. Hello Bartender, I'll take a shot of your best whiskey. ... Gulp... That will be $100,000 thank you very much. The bottle sold already? Damn! I was gonna bid on that.